In order to make up one's mind about glyph scaling and letterspacing in text justification, it is informative to read what central figures in the typographic world think about it. These authorities have differing opinions. Version 3.1. Hartley and Marks, Publishers. 2005. Another thing computer software can do  because Karow taught it how  is justify text by making subtle alterations in the widths of letters. Good justification is calculated paragraph by paragraph instead of line by line. And the best computer justification now relies on microscopic adjustments to the space between and within the letters as well as the space between the words. In this book, for example, the justification engine has been permitted to vary the intercharacter spacing by plus/minus 3% and to adjust the width of individual glyphs by plus/minus 2%. The bulk of the work is still done by adjusting the spaces between words, but there are more letters than spaces in these lines. Tiny adjustments to spaces within and between the letters therefore go a long way toward creating a page of even color and texture. 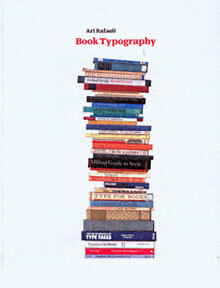 Robert Bringhurst's book «The Elements of Typographic Style» is nowadays an important reference work for everybody interested in typography. 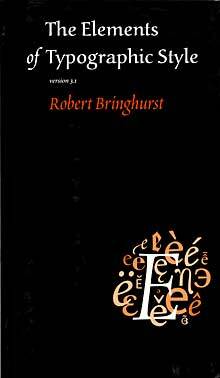 First edition (1992) was produced in Ventura Publisher, second edition (1996) in QuarkXPress. In these two editions he warned against letterspacing of lower case characters and altering letter widths. 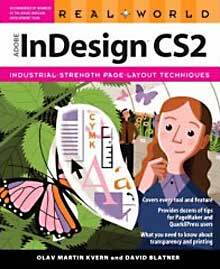 But in the third edition (2004 and 2005), which is produced in Adobe InDesign, he employs these techniques himself. Oak Knoll Press and The British Library. 2005. Adjustment of character-space  increasing or decreasing  by various methods to mitigate the excessive word-space which occurs when an inappropriate measure is used, or when hypenation is inadequately applied, is an expedient which has been practised since the early 1960s when second-generation filmsetting made it possible, but it has never been done to good effect. There seems lately to be a trend in this direction notwithstanding and automatic modification of character-space and also of character widths (to reduce hyphenation and render closer word-space) are featured in one of the newer but already very popular applications, Adobe InDesign. ... one should expect the option (for glyph scaling, my comment) to cause a distortion of each character of an affected line of justified text and perhaps the characters of the preceding or following lines to also suffer distortions, though differently, as widening or condensing will occur according to the amount of word-space which wants either reducing or increasing. Only the slightest distortions, of course. It is regrettable that the venerable designer of some of the best types of the twentieth century should say that such a distortion of letter-forms is 'typographically acceptable'. It may be argued that the distortions, because they are ever so slight, won't be noticed but that is not true: I can see them very well in Hermann Zapf's example. Debate on Adobe Forum (internet), December 2007. I disagree completely. Whether one can consciously notice the squashing and stretching of characters or not, one can certainly «feel» the difference. Glyph scaling is evil, unprofessional and should be removed from InDesign. If you can't solve spacing problems with word spacing and judicious use of hyphenation, then a rewrite is called for. I would rather letterspace than use glyph scaling  and I would rather die than use letterspacing. The question, though (even if «nobody will notice»  which I dispute) is: why take the chance? Other methods exist that do not distort the shapes of the characters. If the reader's eye is sensitive to variation in letter spacing  as seems to be shown by a variety of studies  then we can only assume that it's even more sensitive to variation in character shape. Clearly, the ideal (for text in English, at least) is to set text flush left and use hypenation sparingly to keep the line lengths similar. Then you don't have to worry about the problems introduced by justification. There is nothing good about justification from the reader's point of view. Dissertation, Masaryk University Brno, Faculty of Informatics, October 2000. The improvement of interword spacing depends on the expansion limits. On the other hand, too high expansion limits causes that the effect of font expansion to be visible and thus detracts from the appearance of the typeset text. Choosing expansion limits for a font is thus not trivial and must be done carefully so the effect of font expansion cannot be visible. My experiments have shown that it is safe to expand fonts within such a limit so the variance in character widths must not exceed +/- 2%. 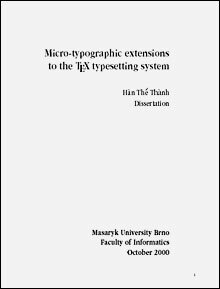 The Thanh Han's impressive dissertation describes the text justification process, before it considers the micro-typographic possibilites in TeX, the hz-program and InDesign. Font expansion (=glyph scaling) is thoroughly discussed - how it works with different font formats, the possibility of scaling only selected characters etc. The dissertation acknowledges the dangers of glyph scaling, but concludes that with small values it is a good thing. See a short presentation of myself here. Published for the first time (in Norwegian) 2007-05-15. Published for the first time (in English) 2008-12-24.